The set of supported query language string constants. 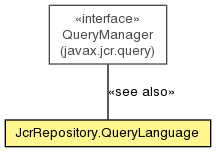 The enhanced Query Object Model language defined by the JCR 2.0 specification. The SQL dialect that is based upon an enhanced version of the JCR-SQL query language defined by the JCR 1.0.1 specification. The SQL dialect that is based upon an enhanced version of the JCR-SQL2 query language defined by the JCR 2.0 specification. The full-text search language defined as part of the abstract query model, in Section 6.7.19 of the JCR 2.0 specification. The standard JCR 1.0 XPath query language.